I came home from our Antigua/ UK trip to a mountain of mail, and included in all of that was a brown envelope containing a copy of the latest Umhlanga magazine. 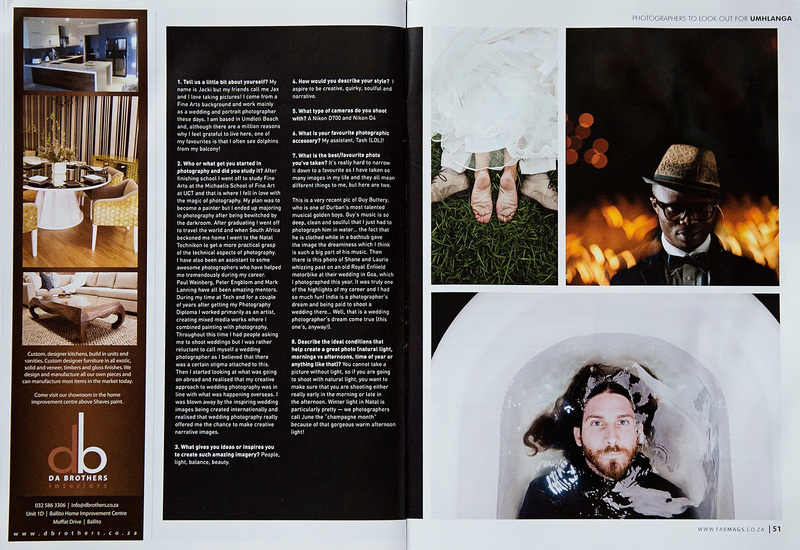 Storm Catterick recently wrote an article about me titled “Photographers to look out for” – 6 whole spreads and the front cover. Wow I am honored! Here are her words as well as pics of the pages. There’s something about a good photograph that captures the imagination and enchants the eye, whether it’s because it’s a memory that will be forever frozen in time, or the fact that you can capture the most precious moments in someone’s life! I have always envied the way in which photographers view life – how they can find something aesthetically pleasing in even the most insignificant or less-than-attractive thing. We are so blessed in our small town to have some truly amazing photographers here, all unique and different in their own way, but with one common underlying factor – they are all brilliant! With this in mind, we decided that during the next couple of months we would profile some of Umhlanga’s best photographers who we think you should look out for when capturing that next special moment. In our first edition we are profiling Jacki Bruniquel, a photographer who is known for her unique style and honest way of capturing memories in her photographs. Jacki is also an accomplished artist, something which enables her to take photography to an exceptional level. 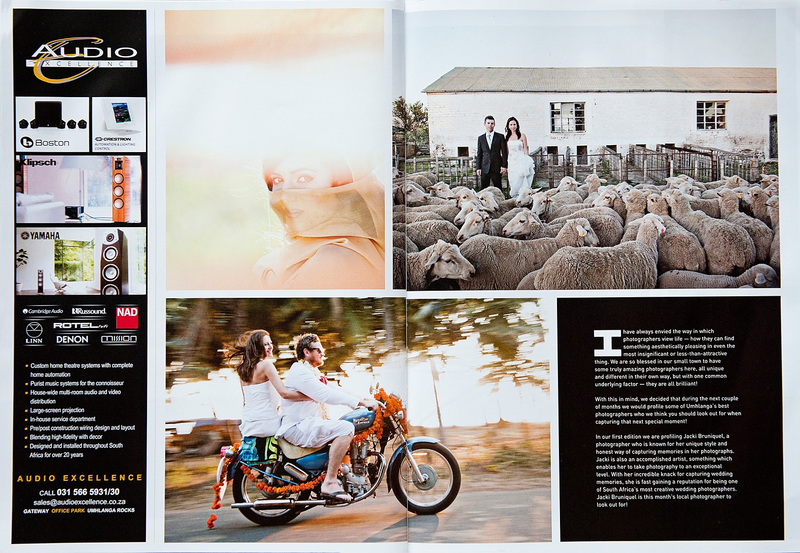 With her incredible knack for capturing wedding memories she is fast gaining the reputation for being one of South Africa’s most creative wedding photographers. 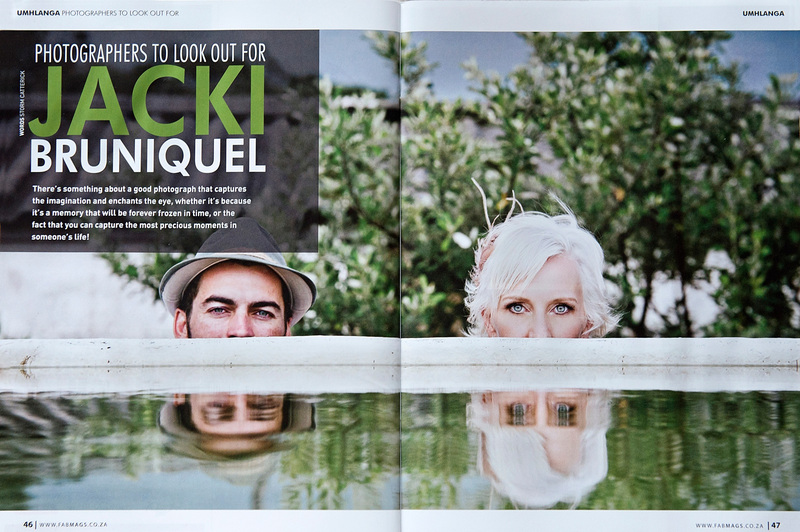 Jacki Bruniquel is this month’s local photographer to look out for! Tell us a little bit about you? 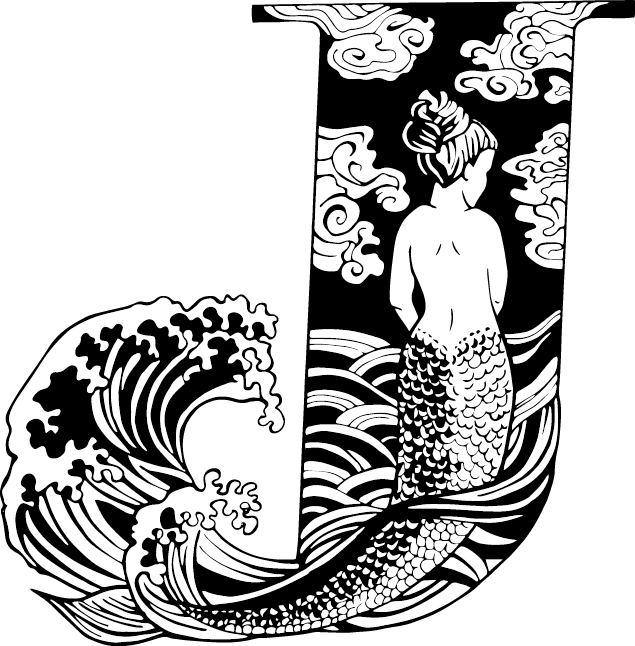 My name is Jacki but my friends call me Jax and I love making pictures! I come from a Fine Art background and mainly work as a wedding and portrait photographer these days. I am based in in Umdloti beach and there are a million reasons why I feel grateful to live here but one of my favorites is that I often see dolphins from my balcony! I started taking pictures when I was 18 and I am now 35, but I have done many things in between! What or who got you started in photography, did you study? After finishing school I went off to study Fine Art at Michaelis UCT and that is where I fell in love with the magic of photography. My plan was to become a painter but I landed up majoring in Photography after being bewitched by the darkroom. After graduating I went off to travel the world and when South Africa beckoned me home I went back to Natal Technikon to get a more practical grip of the technical aspects of Photography. I have also assisted some awesome photographers who helped me hugely during my career . Paul Weinberg, Peter Engblom and Mark Lanning have all been amazing mentors to me. During my time at tech and for a couple of years after finishing my Photography Diploma I worked primarily as an artist making mixed media work where I combined painting with photography. Throughout all of this time I had people asking me to shoot weddings but I was rather reluctant to call myself a wedding photographer as I believed there was a certain stigma attached to this. Then I started looking abroad and realised that my creative approach to wedding photography was in line with what was happening overseas. I was blown away by the inspiring wedding images being created internationally and realised that wedding photography really offered me the chance to make creative narrative images. What gives you ideas or inspires you to create such amazing imagery? I aspire for it to be creative, quirky, soulful and narrative. What is your favourite photography accessory? How important is Photoshop in your final images? I am pretty sure that all digital images are tweaked in some sort of editing software by professional photographers these days. Whether it be adding a bit of contrast or retouching skin or giving an image a certain look there is always some editing and retouching that is done to images before they leave my computer. It’s really hard to narrow down a favorite as I have taken so many images in my life and they all mean different things to me so I here’s two. This is a really recent pic of Guy Buttery who is one of Durban’s most talented musical golden boys. Guy’s music is just so deep, clean and soulful that I just had to photograph him in water …… the fact that he is clothed while in a bathtub gave the image that dreaminess which I think is such a big part of his music. You cannot take a picture without light …. So if you are going to shoot with natural light you want to make sure that you are shooting either really early morning or late afternoon. Winter light in Natal is particularly pretty, we photographers call June the champagne month because of that gorgeous warm afternoon light! 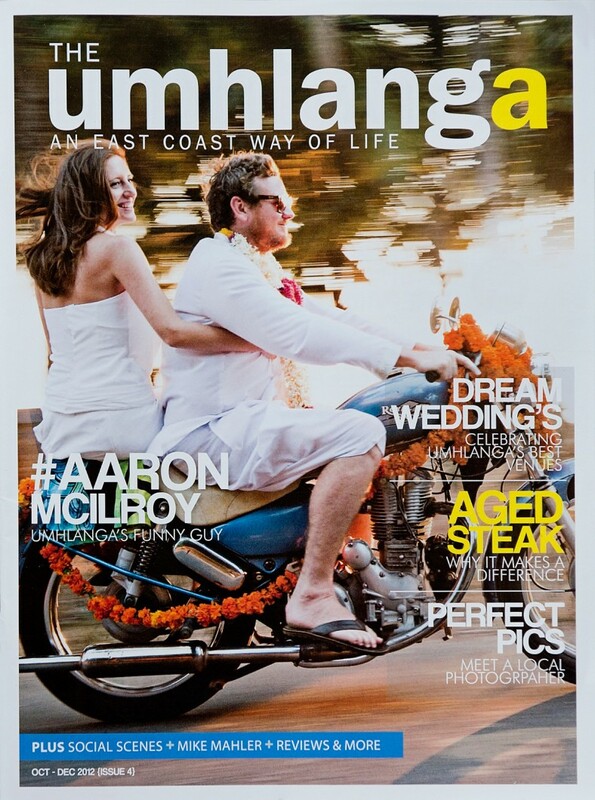 Huge thanks to the Umhlanga Magazine and to Storm Catterick for the feature. Thanks also to my amazing clients for giving me the opportunity to take these images. Amazing! You deserve all the glory – love your work! A big thank you Jacki for all your support in our other features! you are truly a fabulous photographer and it has been a great honour and a pleasure working with you – you have added great value to our magazines!